The goal of the Swartz Center for Computational Neuroscience is to observe and model how functional activities in multiple brain areas interact dynamically to support human awareness, interaction and creativity. Both the single EEG electrode and the single microelectrode are indirect measures of brain activity. Activity measurements from single neurons (bottom rectangle) and single EEG electrodes (top rectangle) can both be said to be relatively "far" from the activities of functionally important brain networks (middle oval). Scalp EEG can record only strongly synchronous activity within these networks, while synchronous input also plays a crucial role in producing both neural spiking and plasticity. Makeig et al. (submitted) suggest that brain networks may typically function independently of each other, allowing brief periods of synchronization including multi-frequency coupling to occur for functional purposes such as recall, motor preparation, attentional focusing, etc. The dynamic independence of neural networks, they suggest, may be as important a principle of brain organization as its topographic modularity. Complete understanding of brain function will require parallel development of computational models of brain activity at both the global (EEG/fMRI) and local (physiologic) levels. 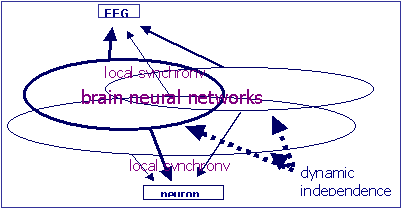 During the last half of the twentieth century, much of neuroscience has focused on patterns of firing of single neurons within small brain areas. However, most brain areas are highly interconnected, and to achieve human speeds and reliability of high-order perception and information processing (e.g., during memory retrieval and associations, language, music and dance, problem solving and interpersonal interaction, etc.) activity within different brain structures must proceed in parallel in a precisely synchronized manner. Recent electrophysiological discoveries make it ever more clear that functionally meaningful brain activity occurs primarily in local neural networks, specifically in their development, maintenance, plasticity and transient coupling and decoupling. In light of this (as schematized in the Figure above), activity at a single neuron, activity at a single scalp electrode, and activity within a single fMRI volume are each indirect measures of functional brain activity. Models of neural communication are now shifting rapidly. Unlike in previous decades, the brain is now known to continually renew and reshape its details (at nearly all spatial scales) in light of experience. Recent neurobiological results suggest an important role of precisely synchronized neural inputs in learning and memory. Much long-range synchronization in the brain appears to be achieved through oscillatory mechanisms in which all parts of the neuropile (the brain's "grey matter") participate. Rhythms of between 1 and 100 cycles per second, the most prominent feature of human EEG have long tantalized biologists, but their relationships to behavior and perception were difficult to model and test. Current electromagnetic imaging technology allows recording massive data sets measuring synchronous neural activities occurring in many brain structures. However, most often these are mixed together in the recorded field images. Moreover, without good models of how these activities are inter-related, these inter-relationships are impossible to measure and observe in the data. Studies at the Swartz Center for Computational Neuroscience, a research center of the Institute for Neural Computation at UCSD, focus on how EEG data (and/or MEG, its magnetic equivalent), alone or combined with functional hemodynamic imaging data, can be used to observe, model and test new theories about how different parts of the brain interact dynamically to support human awareness and behavior. By observing the relationship of EEG and MEG brain rhythms to the physical structure of the brain and to the dynamics of its blood flow patterns, and by relating these observations to current discoveries in brain physiology, research at the Swartz Center attempts to determine the ways in which brain rhythms may play important roles in supporting human cognition and awareness. Recent discoveries by Center faculty of multi-frequency, event-related shifts in oscillatory linkage between maximally independent EEG or MEG components that measure activity in different brain areas supports the view that complex non-stationary oscillatory processes support human consciousness and cognition. These may include the entire range of characteristic brain time scales, from 10-second sleep waves to 6-Hz frontal and midline rhythms involved in concentration and memory and 40-Hz and higher gamma band oscillations induced in response to significant and/or attended events. Although each of these phenomena is amenable to detailed study in animals, only functional imaging (EEG, MEG, fMRI, etc.) of conscious, behaving human subjects has the wide spatial scale and complexity necessary to measure activity in many parts of the brain at once, while allowing scientists the opportunity to study human cognition and awareness directly. In the last decade, the new field of cognitive neuroscience has come into scientific prominence because of technical developments in non-invasive whole-head functional magnetic resonance (fMR) and electromagnetic (EEG/MEG) imaging technologies. There is now a real opportunity and an acute need to develop adequate computational methods for deriving information about how the brain works from the massive data sets produced by these new functional imaging technologies. The current availability of non-invasive, whole-head data from humans during cognitive activities presents an unprecedented scientific opportunity to study the role of dynamic interactions between different parts of the brain in supporting human cognition and awareness. The Center focuses on exploiting this opportunity, bringing together resources to allow its scientists and collaborators to contribute important advances in understanding the basic relationship between the human mind and brain. The Center's work requires new theoretical and concrete mathematical models of brain dynamics, new signal processing techniques based on these models, and new statistical methods. One long-range proposed goal is to study brain interactions that support our face-to-face communication with and awareness of other people's feelings and intentions, human capacities that current functional imaging experiments do not address. Another proposed goal is to study our awareness of time and timing relationships, since this most abstract of our senses may be most intimately related to the timing of our brain activity. Still another is to understand and model the macroscopic synchronous activities supporting emotional expressions (via facial expressions, hand gestures, or in song or speech). The results of these and other planned Center studies may include a more detailed understanding of the strengths and limitations of the human mind, plus possible applications to medicine and to cognitive testing and monitoring. With adequate support from private and public sources and continued intellectual investment, we hope that in coming years the Center may become an important center of human brain theory and research as well as a common meeting place for scientists applying advances in mathematics, biology and psychology to the understanding of the relation between brain activity and human cognition, broadly defined. We foresee opportunities to develop major experimental and theoretic research programs, local and long-range research collaborations, web distributed software archives, networks and tutorials, and a series of catalytic workshops.